حاجی باقری, حمیدرضا, ابراهیمیان, سید علی. (1397). تعیین تجربی موقعیت نشتی گاز خط لوله فشار بالا با استفاده از روش نشرآوایی. مجله صوت و ارتعاش, 7(13), 13-22. حمیدرضا حاجی باقری; سید علی ابراهیمیان. "تعیین تجربی موقعیت نشتی گاز خط لوله فشار بالا با استفاده از روش نشرآوایی". مجله صوت و ارتعاش, 7, 13, 1397, 13-22. حاجی باقری, حمیدرضا, ابراهیمیان, سید علی. (1397). 'تعیین تجربی موقعیت نشتی گاز خط لوله فشار بالا با استفاده از روش نشرآوایی', مجله صوت و ارتعاش, 7(13), pp. 13-22. حاجی باقری, حمیدرضا, ابراهیمیان, سید علی. تعیین تجربی موقعیت نشتی گاز خط لوله فشار بالا با استفاده از روش نشرآوایی. مجله صوت و ارتعاش, 1397; 7(13): 13-22. در این تحقیق تعیین قابلیت آزمون نشرآوایی (آکوستیک امیشن[i]) در تعیین محل نشتی گاز در خط لوله انتقال گاز سراسری ایران با قطر خارجی56 اینچ و فشار psi1050، ارزیابی شد. با توجه به اعلام گزارش وجود نشتی ppm1500 در لوله به طول 8/37 متر محصور داخل غلاف بتنی(ccw[ii])، با عنایت به گازدار بودن خط لوله، عدم امکان قطع جریان و همچنین هزینه بالای تخریب غلاف بتنی، با استفاده از آزمون نشرآوایی، احتمال وجود نشتی در غلاف بتنی و تخمین موقعیت آن ارزیابی شد. در این آزمون در دو سر لوله خارج از غلاف بتنی با نصب حسگرهای پیزوالکتریک عملیات داده­برداری جهت شناسایی منابع صوتی ناشی از نشتی موجود انجام شد. پس از مکان‌یابی داده­های دریافتی با توجه به مشخصات اصلی سیگنال نشتی یعنی RMS و زمان ماندگاری، محل نشتی ردیابی و شناسایی شد. نتایج آزمون حاکی ازعدم وجود نشتی گاز در غلاف بتنی بوده و موقعیت نشتی در محلی خارج از آن شناسایی گردید. با حفاری محل تخمین زده شده توسط نشرآوایی ، نشتی موجود در سر جوش محیطی[iii]، به علت ترک طولی بر روی جوش در ساعت 6 لوله مشاهده شد. که پس از تخلیه گاز خط لوله، جوش تعمیر و هیچ آسیبی به غلاف بتنی وارد نشد. 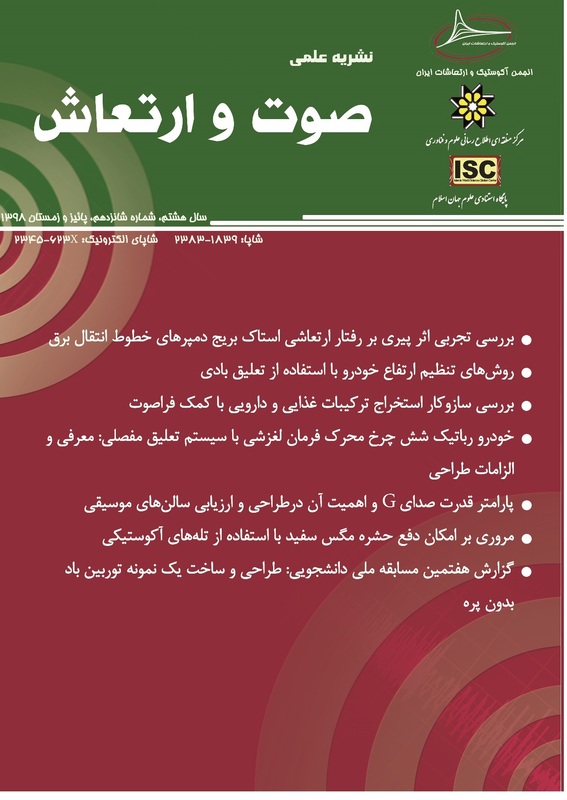 H. Reza Hajibagheri, A. Heidari, and R. Amini, "An experimental investigation of the nature of longitudinal cracks in oil and gas transmission pipelines," Journal of Alloys and Compounds, vol. 741, 2018, pp.1121-1129. “API 5L, Specification for Line Pipe,” in Edition FORTY-FOURTH EDITION, ed. API Standard: American Petroleum Institute, 2008. Liu, Z. Y., X. G. Li, C. W. Du, and Y. F. Cheng, "Local additional potential model for effect of strain rate on SCC of pipeline steel in an acidic soil solution." Corrosion science, Vol.51, No.12, 2009, pp.2863-2871. Mostafapour, A., and S. Davoudi., "Analysis of leakage in high pressure pipe using acoustic emission method." Applied Acoustics Vol.74, No.3, 2013, pp.335-342. Xu, Changhang, Piao Gong, Jing Xie, Huandi Shi, Guoming Chen, and Gangbing Song, "An acoustic emission based multi-level approach to buried gas pipeline leakage localization." Journal of Loss Prevention in the Process Industries, Vol.44, 2016, pp.397-404. Murvay, Pal-Stefan, and Ioan Silea., "A survey on gas leak detection and localization techniques." Journal of Loss Prevention in the Process Industries, Vol.25, No.6, 2012, pp.966-973. Lay-Ekuakille, Aimé, Giuseppe Vendramin, and Amerigo Trotta., "Spectral analysis of leak detection in a zigzag pipeline: A filter diagonalization method-based algorithm application." Measurement, Vol.42, No.3, 2009, pp. 358-367. Buerck, J., S. Roth, K. Kraemer, and H. Mathieu., "OTDR fiber-optical chemical sensor system for detection and location of hydrocarbon leakage." Journal of hazardous materials, Vol.102, No.1, 2003, pp.13-28. “ASTM E1211 / E1211M – 17, Standard Practice for Leak Detection and Location Using Surface-Mounted Acoustic Emission Sensors”, American Society for Testing and Materials, 2017. “ASME Section V, Article 10, Leak testing, Appendix X, Ultrasonic leak detector test," American Society of Mechanical Engineers. Miller, Ronnie K., Adrian A. Pollock, Peter Finkel, Daniel J. Watts, John M. Carlyle, Anthony N. Tafuri, and J. J. Yezzi, "The development of acoustic emission for leak detection and location in liquid-filled, buried pipelines." Acoustic Emission: Standards and Technology Update. ASTM International, 1999. J. Spanner, "Advances in acoustic emission," Dunhart, USA, p.1, 1981. Anastasopoulos, Athanasios, Dimitrios Kourousis, and Konstantinos Bollas., "ACOUSTIC EMISSION LEAK DETECTION OF LIQUID FILLED BURIED PIPELINE." Journal of Acoustic Emission, vol.27, 2009. Thompson, G., and G. Zolkiewski., "An experimental investigation into the detection of internal leakage of gases through valves by vibration analysis." Proceedings of the Institution of Mechanical Engineers, Part E: Journal of Process Mechanical Engineering, Vol.211 No.3, 1997, pp.195-207. Pollock, Adrian A., and Calvin E. Pepper., "Quantitative Analysis of Acoustic Emission from Gas Leaks in a Model Piping System." Review of Progress in Quantitative Nondestructive Evaluation. Springer, Boston, MA, 1999, pp. 427-434. Kovacevich, James J., Michael O. Robertson, Darryl P. Sanders, and Steven P. Nuspl., "Recent advances in the application of acoustic leak detection to process recovery boilers." Tappi journal, 1996. Le Floc'h, C., "Acoustic emission monitoring of composite high-pressure fluid storage tanks." NDT international, Vol.19, No.4, 1986, pp.259-262. Park, Sungho, Seokgoo Kim, and Joo-Ho Choi., "Gear fault diagnosis using transmission error and ensemble empirical mode decomposition." Mechanical Systems and Signal Processing, Vol.108, 2018, pp.262-275. Toutountzakis, Tim, Chee Keong Tan, and David Mba., "Application of acoustic emission to seeded gear fault detection." NDT & E International, Vol.38, No.1, 2005, pp.27-36. Caesarendra, Wahyu, Buyung Kosasih, Anh Kiet Tieu, Hongtao Zhu, Craig AS Moodie, and Qiang Zhu., "Acoustic emission-based condition monitoring methods: Review and application for low speed slew bearing." Mechanical Systems and Signal Processing, Vol.72, 2016, pp.134-159. Ni, Qing-Qing, and Masaharu Iwamoto., "Wavelet transform of acoustic emission signals in failure of model composites." Engineering Fracture Mechanics, Vol.69, No.6, 2002, pp.717-728. Droubi Mohamad G,Faisal Nadimul H, Orr Fraser, "Acoustic emission method for defect detection and identification in carbon steel welded joints." Journal of constructional steel research, Vol.134, 2017, pp.28-37. Cao, Menglong, and Libin Huo., "Natural gas pipeline valve leakage rate estimation via factor and cluster analysis of acoustic emissions." Measurement, Vol.125, 2018, pp.48-55. Husin, S., A. Addali, and D. Mba.,"Sensitivity of acoustic emission (AE) technology in monitoring oxide formation on an aluminium surface." Insight-Non-Destructive Testing and Condition Monitoring, Vol.53, No.12, 2011, pp.677-681. Kourousis, Dimitrios, Konstantinos Bollas, Athanasios Anastasopoulos, ENVIROCOUSTICS ABEE, and G. R. E. E. C. E. Athens., "Acoustic Emission Leak Detection of Buried Oil Pipelines, River and Road Crossings." Envirocoustics ABEE, 2010. Inaba, Hidehiro. "AE Sensor (AE Transducer), " Practical Acoustic Emission Testing. Springer, Tokyo, 2016, pp.35-43. "ASTM E650-97 Standard Guide for Mounting Piezoelectric Acoustic Emission Sensors," American Society for Testing and Materials, 2007. Bouchard, P. J., "Validated residual stress profiles for fracture assessments of stainless steel pipe girth welds." International Journal of Pressure Vessels and Piping, Vol.84, No.4, 2007, pp.195-222. Kim, C. D., "Hydrogen-damage failures." ASM Handbook, Vol.11, 1986, pp. 245-251.